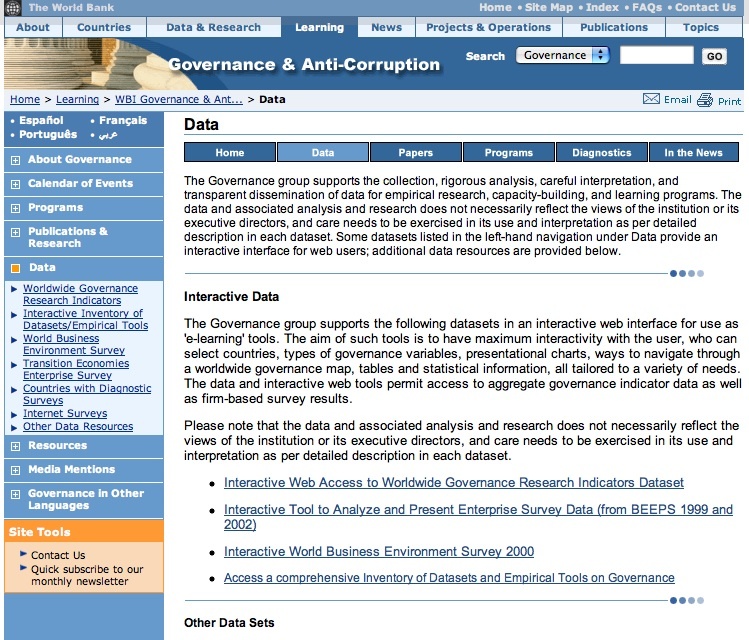 The Governance Databank is maintained by the Governance Group of the World Bank (which facilitates action-oriented and participatory programs to promote good governance and curb corruption in its client countries). Meeting the growing demand for quantifying the governance performance of countries, localities, and institutions, the database provides access to recent statistical data taken from World Bank publications and projects. This includes indicators on political stability, government regulation, political corruption and accountability, government effectiveness and the rule of law for over 185 nations worldwide. The various datasets available (over 140) include some basic information and characteristics, generally providing free access to a large amount of information, papers or charts, as well as to several searching tools. Some datasets may be downloaded in a zipped format, while others are accessible through an interactive interface to the web user as an e-learning tool. Some material is available in several different languages, including Spanish, French, Arabic and Chinese and is retrievable through a local search engine which offers multiple choices and quick results.